A crowd of 6500 people visited Paloma Park in Marangaroo on Saturday 16 March for an evening of eclectic food and electric tunes from the four corners of the globe. Crowds flocked to Paloma Park for an evening of great food and great music. Rounding out the evening was headline act The Beautiful Girls, who wooed the crowd with a set packed with their signature blend of gentle acoustic and funky beats and reggae. Groovy blues maestro Ash Grunwald took to the stage earlier in the evening, belting out a string of smooth soul and R’n’B tracks. Support acts included Western Australia’s own alt-folk staple Riley Pearce, Los Angelesbased singer/songwriter Mia Dyson and Victorian seven-piece street funk act The Seven Ups. Indigenous dance troop Koolangkas Kreate, traditional Polish folk dancers Kukuleczka and Japanese Wadaiko ensemble, Taiko On kept the blood pumping in between musical acts, while roving performances from Chung Wah Lion Dancers added a splash of colour and movement throughout the evening. The festivities were complemented by a selection of cuisines, with a fleet of food trucks filling Paloma Park with aromas from as far and wide as Mexico, India, Argentina and Vietnam. 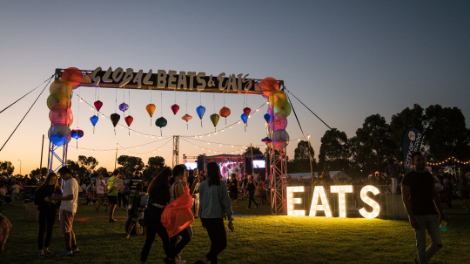 Global Beats & Eats brought the City of Wanneroo’s 2018/19 events season to an exciting close. Stay tuned for announcements about the 2019/20 event season, which kicks off in Spring.